“More of the same” is often used as a negative expression. But if you think back at how great the original Cut The Rope [$0.99|$1.99] was when it was available for your iPhone not even 1 year ago, it’s clear that “more of the same” is a positive thing for such a great game. In the (unlikely) case you are unfamiliar with Cut The Rope, here’s the wrap-up: It’s a physics based puzzle game featuring a little creature called Om Nom that lives inside a box and wants to be fed with candy. And it’s your job to make sure the candy makes it into Om Nom’s mouth. Easier said than done. 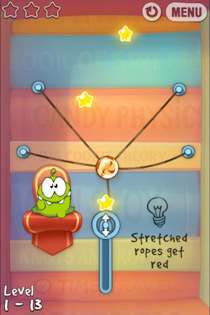 Cut The Rope: Experiments [$0.99|$1.99] is not so much of a sequel, but more like an expansion to the original game. I’m sure that the devs at ZeptoLab were aware of that fact and that’s the reason why it’s not marketed as a sequel. Right now, the game comes with 3 boxes that each feature 25 levels. The first box is pretty much a recap of everything you’ve been introduced to in the original Cut The Rope and gets you back on top of its gameplay. 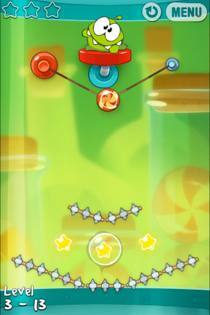 The 2nd box introduces a new item, a button that automatically aims at the candy and, once tapped, shoots a rope at it. In the 3rd box the game gives you buttons that you can detach and reattach thanks to suction cups. It’s fun to start messing around with the new objects to get the hang of them. They give a completely new way to interact with the candy and it’s pretty satisfying to nail the perfect timing that the two buttons often require. Besides these new items, everything pretty much stayed the same. Of course, there’s a new little intro video to set the scene as well as some new backgrounds and sound effects. But overall, everything’s still the good old Cut The Rope that we know and love. Why fix it, if it’s not broken, right? The UI works, the controls are tight and little Om Nom as adorable as always. Like in the original Cut The Ropes, there are already new levels announced for you to download on the App Store in free updates. And that’s something I’m definitely looking forward to, because it doesn’t take long until you’ve mastered all of the 75 levels. But ZeptoLab offered top notch support and a ton of new content for the original, so I’m confident that Cut The Rope: Experiments will grow nicely over time. It’s worth mentioning that this time around, ZeptoLab released the game themselves without a publisher taking care of it. And I think that explains quite a few things about Cut The Rope: Experiments. 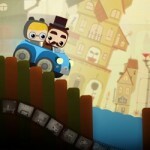 If you’re a indie developer and you just separated yourself from such a big name like Chillingo, you should probably look into three things: Get your own name out there, strengthen the brand that you’ve established and get some capital to ensure liquidity and give you the option to reinvest in future projects. So in my idea, Cut The Rope: Experiments is more than just a sequel, it is ZeptoLab first and important step to become completely independent. The quality of Cut The Rope: Experiments makes me confident that ZeptoLab has what it takes to release many more great titles on the App Store. 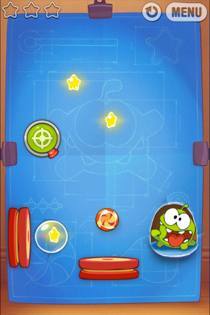 But see for yourself, Cut The Rope: Experiments [$0.99|$1.99] is a great puzzle game that you shouldn’t miss if you’re a fan of the genre.